Our Fantastic Food Writing Competition Winners and Finalists! It is almost inconceivable that the very first Harry Potter film (Harry Potter and the Philosopher’s Stone) in the hugely successful series came out way back in 2001. The popularity and interest in both J.K Rowling’s books and the 7 subsequent films since the original, shows no signs of abating even though the last film was released in 2011, and the actors in the films are all grown up and gone their separate ways. My son who’s 8 now, wasn’t even born when the first film came out, yet he has read all of the books, watched most of the films (the ones that aren’t too scary!) , owns Harry Potter fancy dress and various artefacts, and is an avid participant in the online community of Pottermore. It is likely that the most-successful film franchise in history will attract a whole new generation of fans once the planned spin-off trilogy based on the fictitious book ‘Fantastic Beasts and where to find them’ comes out in 2016, 2018 and 2020. The main character in the new films will be Newt Scamander, and be set in 1920’s New York City. Fans of the existing films are able to immerse themselves in the full filmic experience at ‘The Making of Harry Potter’ at Warner Brothers Studios near Watford. 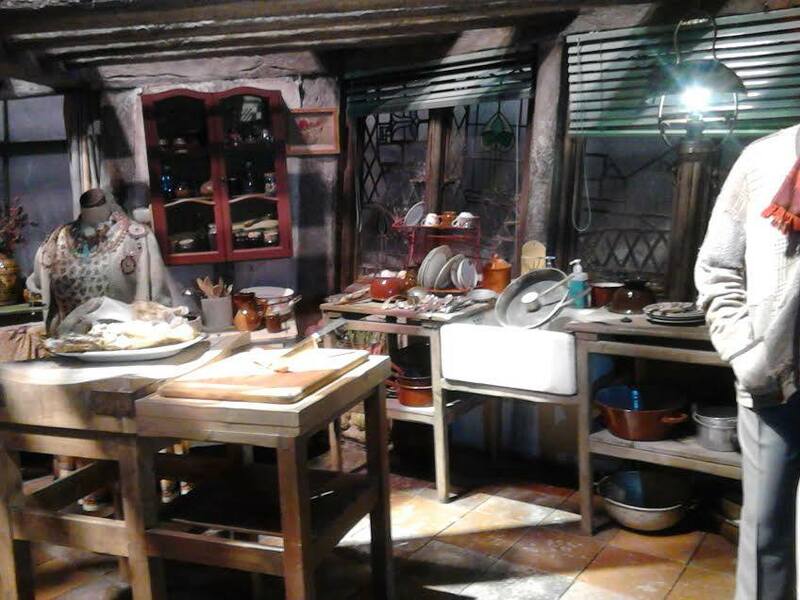 Every Harry Potter fan should make the pilgrimage to the place where the films were shot, and where you can take a look at authentic sets and props from the films. Unsurprisingly, visits are extremely popular, and you must book up in advance and find out the time-slot that you are eligible to start the tour. The first couple of sections of the tour are guided by experience employees, and there is a limit to the numbers of people who can fit in each section, before the tour becomes self-guided and you can set your own pace. Some of the people on the tour opted to pay extra to take the audio tour, but we relied on my son for any gaps in our knowledge when we went for a family visit! When we visited, the theme was ‘Hogwarts in the Snow’, and exhibitions and themes change regularly, so do check to see what’s coming up. Find out about prices and more details here. I don’t want to give away too many details of what you can see when you come, as there are so many ‘wow’ moments that are so much better if they are a genuine surprise. Suffice to say that family members of all ages will enjoy their visit, even those who aren’t fans of Harry Potter will enjoy the spectacle, and will no doubt resolve to watch the films on their return home. The big surprise for me when I visited was that adults definitely outnumbered children amongst the visitors (although I suppose this wasn’t such a surprise considering the dates the films were released) and my only negative of the visit was the fact that some of the adults weren’t very generous in allowing children to take a closer look at things or have a go at the interactive elements. Another thing to be aware of is that there are so many brilliant photo opportunities, that you did sometimes feel like you were regularly trying to avoid photobombing someone’s lovingly-lined up shot! – The friendly and helpful staff – they were cheerful, knowledgeable and keen to assist. When my children were disappointed they couldn’t get their “passport” stamped because they hadn’t picked one up before we went in, a member of staff picked up on this and gave both of them a passport that had even been stamped with the ones they’d missed – very thoughtful. Another staff member (who’d actually appeared as an extra in some of the films) was happy to talk about his experiences and demonstrated with the aid of a basic-looking but very effective piece of equipment – how footprints appeared in the snow when Harry Potter was wearing his invisibility cloak. Great customer service was provided when I mislaid some photos of my son from the broomstick experience (by hanging on the hook on the back of the toilet door – beware!) and the information desk took our details and promptly sent in the post to us for free – impressive! It was amusing when we were asked to provide details of my son’s appearance – and we wrote down “Harry Potter glasses and a scar on the forehead” Our description obviously worked, as they were tracked down! – The great photo opportunities – from Number 4 Privet Drive, Hogwarts bridge and the chance to sit in the flying car from the Chamber of Secrets – fantastic photo opportunities abound! The kids loved being snapped next to Dobby, and swinging from the Knight Bus, and there was also the chance to do the “broomstick experience” – where you have the option to buy the photos that I unfortunately mislaid… My son had a whale of a time appearing in his own flying scene from the films, as he sat on a broomstick in front of a green-screen. We watched as scenery rushed past and he was instructed to “look around” and “put your hand in the water” by a staff member and it was great fun for both us and him – although we did resist buying a copy of the DVD for £25 (prices are rather high generally in the shop and when buying food and drink too). – The sets – there are recreations of the actual sets that were used in the films, which immediately made you feel as if you were part of the film as soon as you step onto them. There is so much attention to detail that you can’t help but be impressed with the meticulous creation of the Harry Potter world on screen. 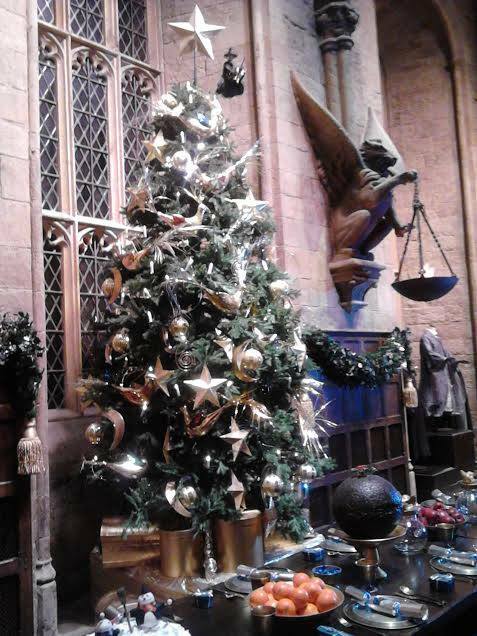 The authentic props (such as Harry Potter’s first ever Hogwarts gown) are great to see, and it is amazing to see things such as hand-written copies of the Daily Prophet and the way that a number of sets of identical clothes are ‘stressed’ to show the effects that a turbulent storyline will have on them. You can’t help but have a great respect for all of the people involved with making the films, and it really feels as if the films were a great joint effort, with Daniel Radcliffe, Rupert Grint and Emma Watson, treated with great affection by those who worked on them. – The butterbeer! Butterbeer was of course the tipple of choice for the off-duty Hogwarts students relaxing over a pint in the Three Broomsticks (no, it’s not alcoholic!) and it’s something that you HAVE to try whilst you’re there. Sure, there is coffee available, but you can drink coffee anywhere, butterbeer is the unique preserve of Harry Potter. It is definitely marmite, as we witnessed several full cups being unceremoniously thrown into the bin, but it is a unique drink that needs to be experienced whilst you have the opportunity. From the bubbly (yet not fizzy) amber consistency to the froth on top, you have to experience the cream-soda taste sensation and make up your own mind! 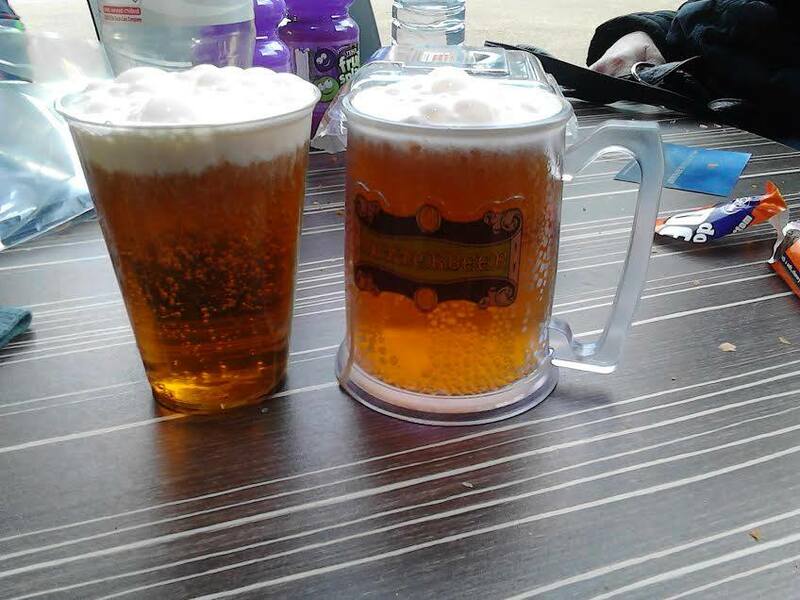 We chose to have our butterbeer served in a mini-tankard with “butterbeer” emblazoned on the front, which I then cleaned up and brought home with me – refreshment and memento in one – winner! There are other sweet treats that were brought to life in the books and films that you can buy in the store at the end of your journey through the attraction. From chocolate frog (with holographic wizard card) to Bertie Botts Every Flavour beans, you can sample these treats (or not – if it’s a yucky flavour…) as well as browse the well-stocked store for that perfect piece of Harry merchandise. – The best parts are the ones that I’m not going to tell you about because the real enjoyment is in the reveal…just when you think you’ve seen it all, you turn a corner and you’re surprised and delighted again…..with 8 films under their belt and the undeniable charm and popularity of the wizarding world that J.K Rowling so cleverly created, this attraction provides the opportunity to be a part of it, and to step into the magic for a little while. So channel your inner wizard and catch the Knight Bus to ‘The Wizarding World of Harry Potter’, all muggles welcome!